In 1996, Tom Cruise sought to bring Mission: Impossible to the big screen with his producing partner, Paula Wagner, and with the help of director Brian DePalma it became a huge hit, grossing $457 million worldwide on an $80 million budget. Twenty-two years later, the series has gone on to gross a cumulative $2.7 billion to date, making it the 20th-highest-grossing film series of all time. Overall, the Mission: Impossible series has remained remarkably consistent in quality, and more importantly, it has constantly evolved. With the sixth film in the series already getting rave reviews, scoring an impressive 94% on Rotten Tomatoes and shattering box office records, we decided to rank all six entries from least to best. It’s baffling that Mission: Impossible II was the highest grossing movie of 2000 given that it’s such a run-of-the-mill action flick. It’s equally baffling that it was directed by iconic Hong Kong action filmmaker John Woo (who had a reputation for directing some of the greatest action films of all time including The Killer, and Hard Boiled), because Mission: Impossible II is, simply put, not a good movie. One of the biggest criticisms leveled against Brian DePalma’s 1996 blockbuster was that it was too convoluted. Well, Mission: Impossible II aimed to correct that wrong by employing a straightforward plot. Unfortunately, what we got was a generic action thriller simply designed to showcase the star appeal of Tom Cruise, and little else. Here, everyone seems to be going through the motions, and with the exception of the pre-credits sequence (featuring Ethan dangling off a massive cliff), there’s little to raise the pulse. Seriously, I’d take De Palma’s vision any day over this. 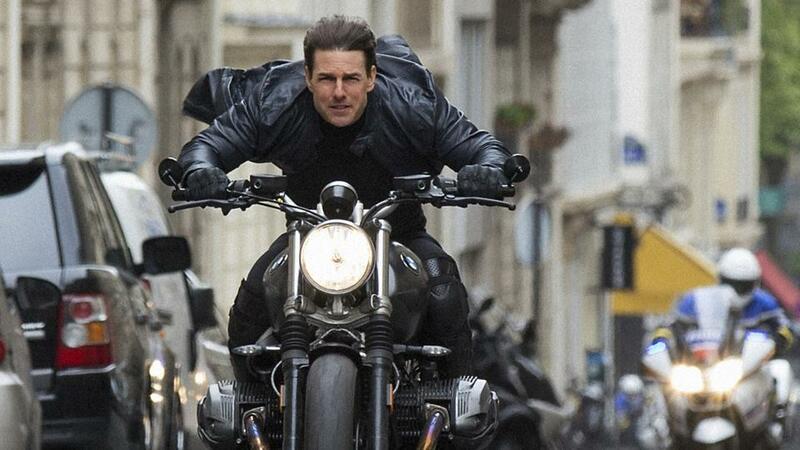 Hell, even the final chase, which features motorcycles zig-zagging through traffic, would eventually get bested by another M:I film, that being Rogue Nation. Cruise’s third outing as IMF agent Ethan Hunt saw the franchise switching directors for a third time, but finding its one true auteur: Cruise himself. JJ Abrams took over the thankful task for his directorial debut, offering a zippy — if slight — entry that falls somewhere between a two-hour PR image campaign for Cruise and an extended episode of Abrams’ Alias TV show. This is the first M:I film to give Hunt a genuine love interest in Michelle Monaghan’s Julia, which allows Abrams to indulge in countless romantic Michael Giacchino string solos, and Cruise to do that awkward face grab he likes to do with his sweethearts. Much of the plot revolves around the IMF hunting a chemical device called the ‘Rabbit’s Foot,’ but it’s not really important next to the action, which is unfortunately the product of mid-2000’s gritty shaky cam style. Mission: Impossible – Rogue Nation stands out amongst the rest of the franchise because it stands as the first film to finally balance the tone of the series. From light laughs to insane stunts, Rogue Nation takes it all in stride. It feels like a well-oiled machine, just taking you through a buffet of trademark moments we expect in the series. It also provides the best female lead the series has ever had, and one of the best villains in the franchise. 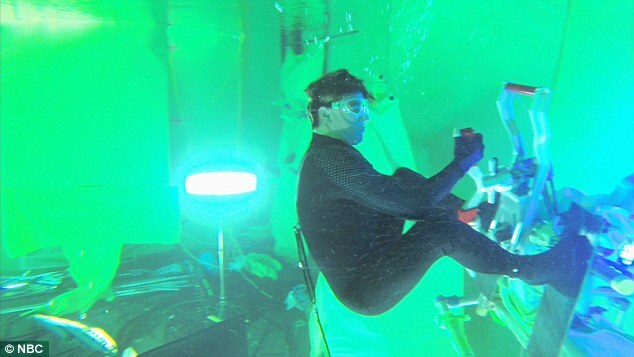 With an opening scene having Tom Cruise hanging off the side of a plane, Christopher McQuarrie immediately establishes this film as a stunt-heavy effort. Wrapped up in a classic spy story of shadowy organizations and double agents, the most accomplished feat of this film is its sequence at the Vienna Opera House. The scene quickly cements itself as one of the best in the franchise because of its mystery and intrigue within an elaborate setpiece. Leading into further espionage and a relationship between Ilsa Faust and Ethan Hunt that never quite hits romantic, but also never feels completely without investment from either party, this is easily one of the best in the series. More impressive is that this is the first film in the franchise that feels like its really going for the “how far can we push these Tom Cruise stunts” motif. While Ghost Protocol hangs its hat on the Burj Khalifa sequence, Rogue Nation opens with Cruise hanging from a plane, has Cruise hold his breath for six minutes (!) for an underwater section of a heist, and then immediately after that he does a motorcycle chase that still gets me far too riled up when I watch it. Keeping that little bit of levity from Ghost Protocol was crucial to make this not just be a morbid exercise in tension, keeping these death-defying stunts fun — even if they’ll still give you a heart attack. 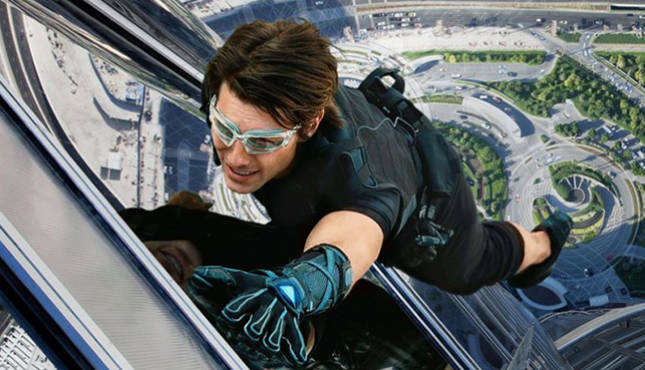 Mission: Impossible – Ghost Protocol is the sort of movie that wins you over with sheer audacity. It’s inherently ridiculous, but it knows it is, embraces that fact, and uses it to dazzle and delight. If it weren’t for how accomplished the many elaborate set pieces are perhaps we’d be laughing at it, but because they’re so well constructed we’re laughing with the movie in giddy disbelief at what our heroes will go through next to save the day. The baddie this time around is a madman hell-bent on nuking half of the world to cull the herd and make a less over-populated human race prosper through hardship. Or something. It’s not really important. What’s important is that it gives Tom Cruise and Co. ample excuse to travel the world and get caught up in all sorts of deadly situations for which there’s no feasible method of escape, and then they escape anyway. It’s debatable whether or not Mission: Impossible – Fallout is the greatest film in the series, or merely one of the best, but it’s safe to say that no other entry gets one’s adrenaline pumping quite as effectively. That’s because returning director and screenwriter Christopher McQuarrie is a master of pacing and escalating tension (even if his dialogue is occasionally not so fresh). Combine those skills with the ever-capable Tom Cruise and the most extreme stunts he has ever filmed, and you’ve got a pinnacle of the M:I series. One striking difference between Fallout and all the previous entries is that it’s a direct sequel to 2015’s Rogue Nation. The M:Ifilms have – until now – been mostly disconnected. Characters essential to one film are usually absent in the next one (except for Ving Rhames, the only actor besides Cruise to appear in all six film). Here, however, the actions picks up right where it left off. The fate of the IMF is still uncertain, and Cruise’s Ethan Hunt is still inescapably tied to Rebecca Ferguson’s talented assassin and Sean Harris’ genocidal psychopath. Some critics have detected a Nolan-esque slide toward the dark side in Fallout, both emotionally and visually, which isn’t wrong, but is still somewhat misleading. The Hunt of previous M:Ifilms has been a cypher; we come to see him defy death, not feel sad. Fallout‘s dream sequences change that, giving us one of the first signs of an interior life for Hunt. That, coupled with the ability to further develop its cast, suggests an interesting future in which the M:I films might become something radically different. The first entry in a franchise often sets the tone and formula for what follows, but instead of taking a position as team leader, 1996’s Mission: Impossible stands out as a rogue agent in its own series. The balls-to-the-wall, run-and-gun approach that that made its sequels into nothing more than a breezy, American version of James Bond is nowhere to be seen here. Hidden under the slick latex mask of a summer tentpole release is an actual spy movie — perhaps not in realism, but in intelligence, and most importantly, in lack of noise. 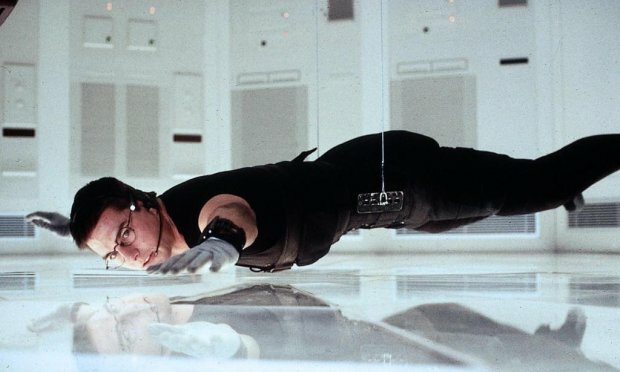 Mission: Impossible dared to try something that for most blockbusters is anathema: nearly excluding violence from its “action,” and it pays off with some of most memorable set pieces in movie history. The chaotic unravelling at the American Embassy in Prague, Ethan’s simmering tête à tête with a superior in a Czech restaurant, the wonderfully charged moments of hotel-room paranoia, proving his worth to an arms dealer, and of course, a virtuoso break-in sequence set at CIA headquarters in Langley, Virginia — the artistic hand of Brian De Plama mercilessly ramps up the tension in Mission: Impossible with no gunfights, car chases, or motorcycles driving through fire while doves fly in the background. He relies instead on skillful filmmaking, using precise staging and careful compositions to convey both story and character. Skewed angles and depth of field create unsettling imagery, slow zooms narrow our focus, and mechanical pans act like surveillance cameras — the audience is also in on the spying. A movie called Mission: Impossible should be fun too, however, and so bright colors and a brisk script make sure that all the subterfuge stays on the stylish, lighter side. Really, they’re almost all interchangeable to me after the first two. The bland hand of JJ strikes again.